New Jersey Parking Lot Accident Lawyer | Tomes & Hanratty P.C. Parking lots allow easy access to a variety of municipal, private, and commercial properties. We use parking facilities to easily stop by schools, court houses, malls, apartments, airports, and much more. In New Jersey, the property owner is responsible for the parking facility. The parking lot must be monitored regularly for any hazards that could hurt a person who uses it. When these surfaces are not reasonably free of hazards and people are hurt, the property owner is most likely responsible for the injuries sustained. Conditions left unattended put everyone in danger. These may include weather-related conditions, pavement problems, loose debris and standing substances and poor lighting. As is with other personal injury matters, you will have to prove that the parking lot accident was caused by the negligence of the property owner. If you are successful, you may be entitled to compensation for your injury. If you need a law firm with experience handling these cases and the passion to fight for your rights, you should contact Tomes & Hanratty, P.C. for an initial, free consultation. According to the laws of New Jersey regarding personal injury cases involving slip and falls, the burden of proof is on the victim. 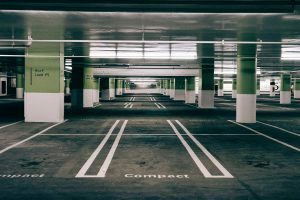 If the owner of the parking facility knew about the condition or should have reasonably known about the problem that caused your injury, you are entitled to damages to compensate you for your injuries. You could recover payment for your mounting medical bills, lost wages, and even legal fees. You may be able to sue for pain and suffering as well. Most hazards are avoidable within reason and a property owner should take every precaution to ensure the safety of those who use his or her parking lots. It is important to note that if you were injured because of snow and ice, when you were injured makes a difference in your case. All property owners have a certain amount of time after a storm to clear the surfaces of the condition. If you used the parking lot within the time provided by the municipality, you may not be able to sue for damages. It is always best to be a resource to yourself when facing the possibility of a personal injury lawsuit. Firstly, always seek medical attention. Your health should always be the priority. When you seek medical attention, you are also collecting evidence because they will document your injuries, including the place and time the accident occurred. If you are able, take pictures and talk to witnesses. It is important for you to act quickly or contact our firm to act in your stead. If you are injured by the negligence of another person, you have rights to exercise. It is important to consider your legal options when faced with serious injury in a parking lot accident. Our firm has over 30 years of experience helping our client receive the compensation they deserve. If you need quality legal support, please contact our firm for a free, initial consultation.